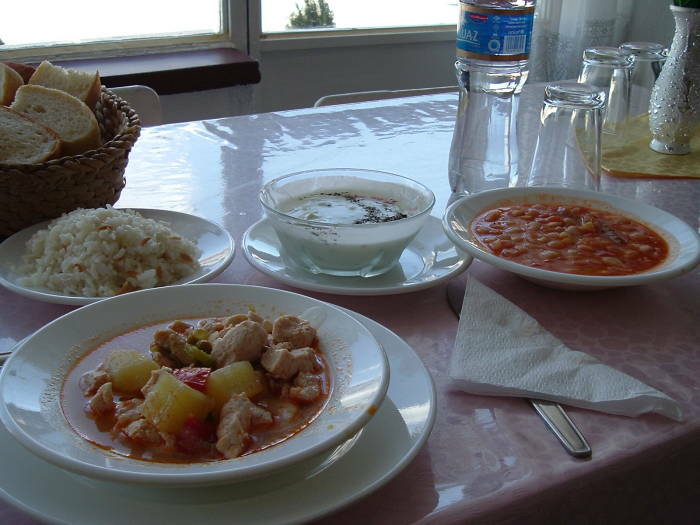 Turkish cuisine tastes great and it appears to also be good for you! It's very similar to what is commonly called the Mediterranean Diet. When accompanied by regular physical activity, like walking around to see all the historical sites, or mountain trekking, or the other things you get up to in Turkey, this general diet is believed to be correlated with lower rates of cardiovascular disease. 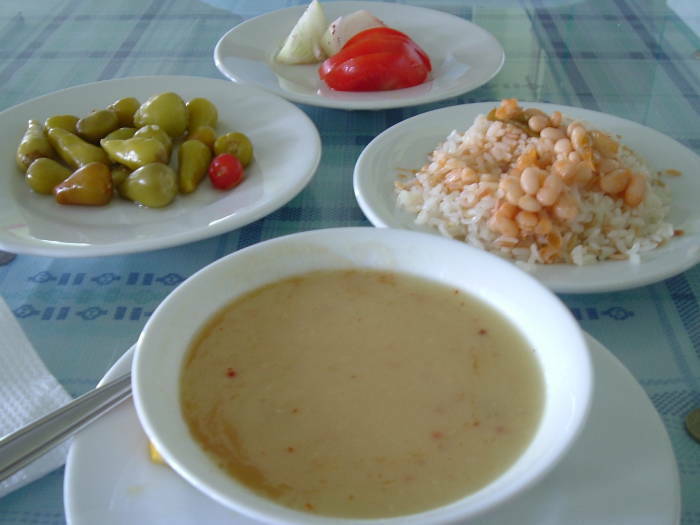 While the typical examples of Mediterranean diet are the cuisines of Greece and southern Italy, Turkish cuisine is similar. The benefits come from an emphasis on plant foods, olive oil as a significant source of fat, dairy products (typically cheese and yogurt), fish and poultry typically grilled (but red meat in low amounts), fresh fruit for dessert, and wine in low to moderate amounts. Described another way, it's high consumption of: olive oil, legumes, unrefined cereals, fruit, and vegetables; moderate to high consumption of fish; and moderate consumption of dairy products and wine. Modern Turkish cuisine is the result of history — the history of the Turkish people themself and of the vast Ottoman Empire that included south-eastern Europe, most of the Middle East and North Africa. 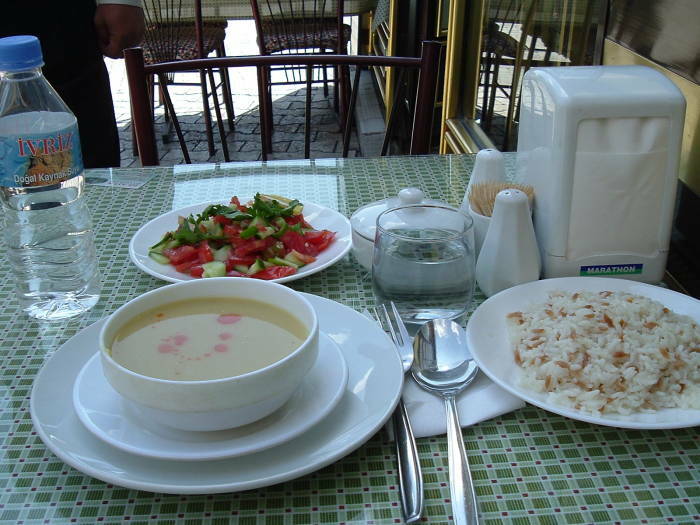 It includes traditional Turkic elements from Central Asia such as yogurt and grilled meats. Good food starts with good ingredients. 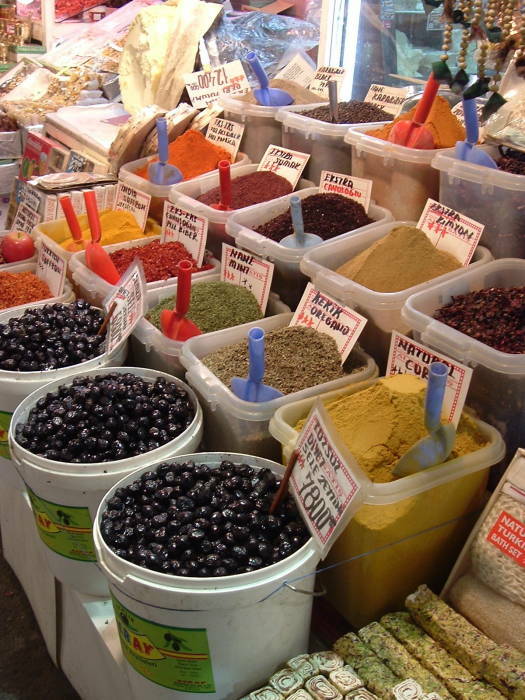 Here and below are spices sold in bulk near the Golden Horn in İstanbul in Mısır Çarşısı, or the Egyptian Bazaar. 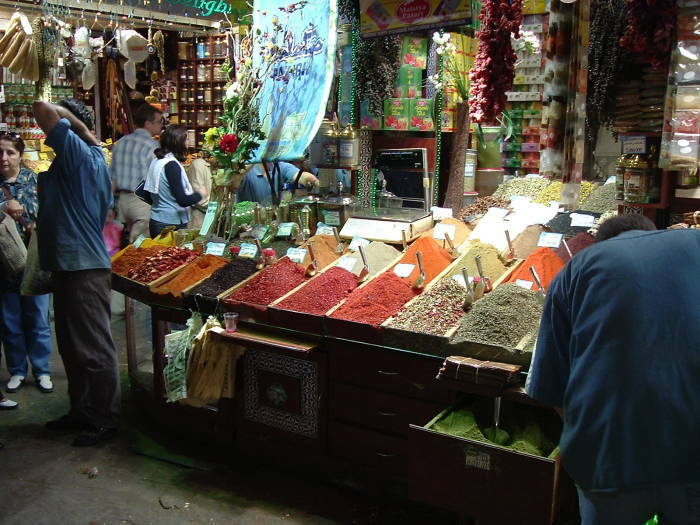 It's also known for obvious reasons as the Spice Bazaar. Below you also see an array of olive varieties. 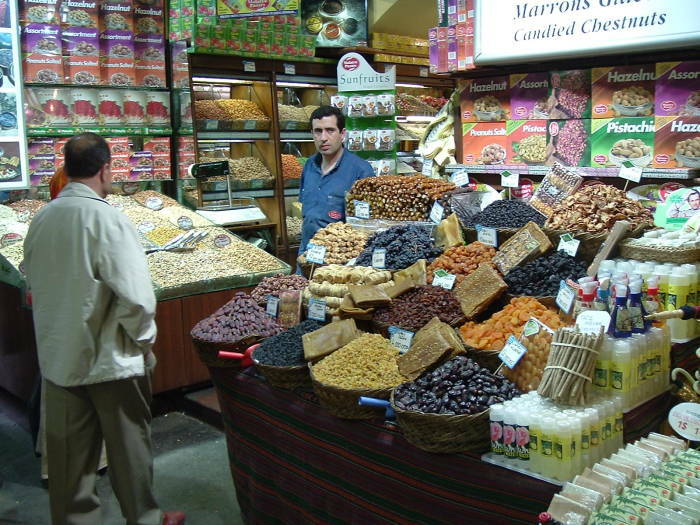 This shop in the Egyptian Bazaar carries a wide range of nuts and dried fruits including raisins, dates, figs, and apricots. Turkey is the world's leading producer of apricots and figs. The area in east-central Turkey around Malatya is famous for its apricots. Almonds and other nuts are also grown in Turkey. The country is the world's leading producer of hazelnuts the #3 producer of pistachio nuts, and #8 for almonds. You don't have to go to İstanbul to have choice and quality. 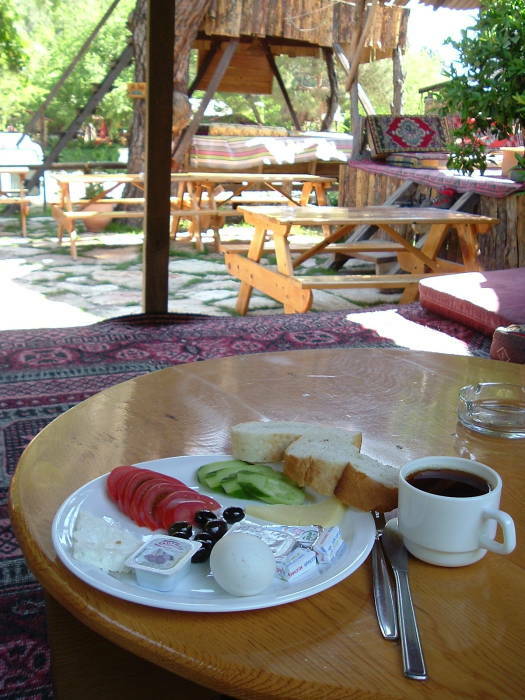 The Turkish word for breakfast is kahvaltı. It literally means "before coffee" — kahve for "coffee" and altı for "before". So you have tea with your breakfast and not coffee! 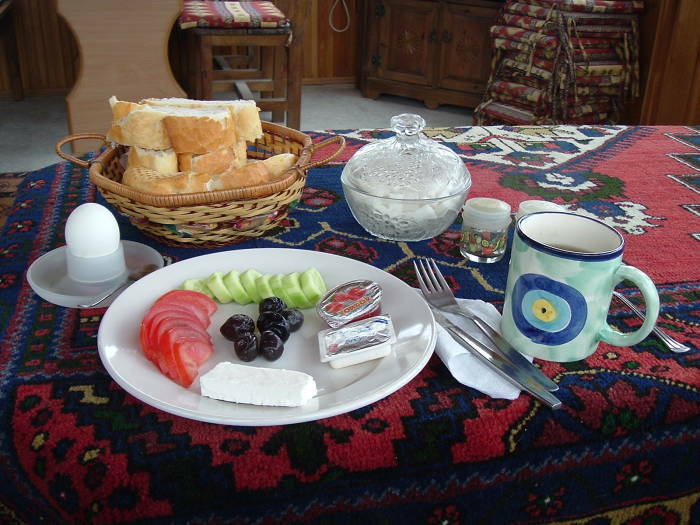 We're starting the day with typical Turkish breakfast:. 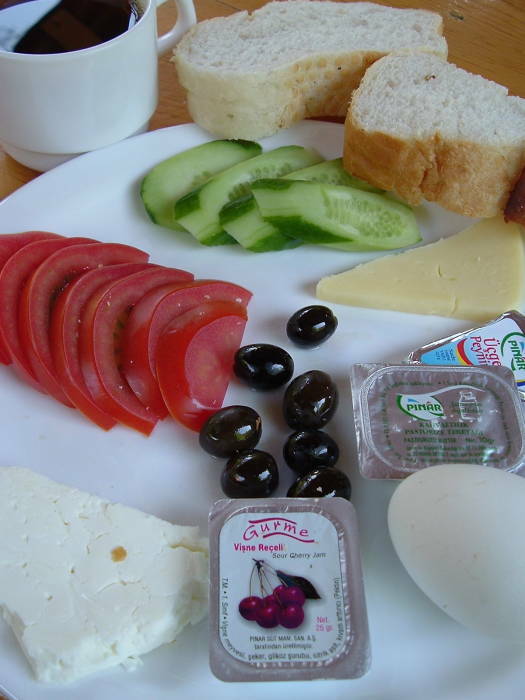 Other common breakfast foods include yogurt, often served with honey, and menemen, somewhat similar to Mexican huevos rancheros. English took the word yogurt or yoghurt from the Turkish yoğurt. 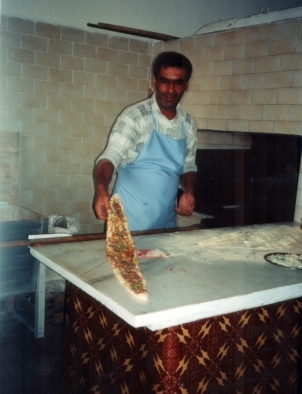 Kebab, or kebap in Turkish, is very common. 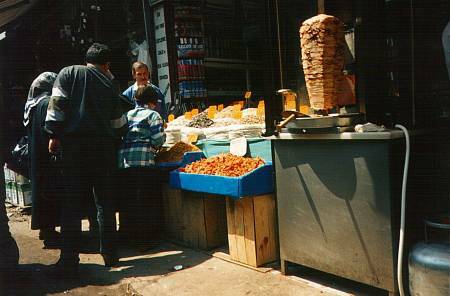 Here's a typical scene — a skewer of chicken kebab next to an array of dried fruits and nuts. A quick sandwich for right now, or fruits and nuts to take away for later. Or both! Hot grilled meat prepared right in front of you — this is food you can feel safe about eating. Döner kebap literally means "rotating meat", and it can be either lamb (kuzu) or chicken (tavuk). Basic rotating meat on a vertical spit kept hot by a nearby gas burner or electrical heater. Literally "skewered grilled-meat" in Turkish, it's small cubes of meat threaded on a skewer, typically with vegetables including eggplant (aubergine or patlıcan in Turkish), tomato, green pepper, and onions. Tavuk şiş is chicken, kuzu şiş is lamb. Pounded boneless meat with tomatoes and garlic marinated with black pepper, thyme and oil and grilled on wooden skewers. Finely minced meat mixed with spicy red chili pepper and pressed onto a flat wide metal skewer before grilling. Döner kebab on pide with melted butter and tomato sauce and with a side of yogurt. Sometimes called Bursa kebap. "Sultan's kebab", sliced lamb with patlİcan beğendi or eggplant puree, basil, thyme, and bay leaf. Köfte is a pressed meatball made from finely minced and spiced meat. It can be used in place of döner to make dishes like köfte şiş and so on. 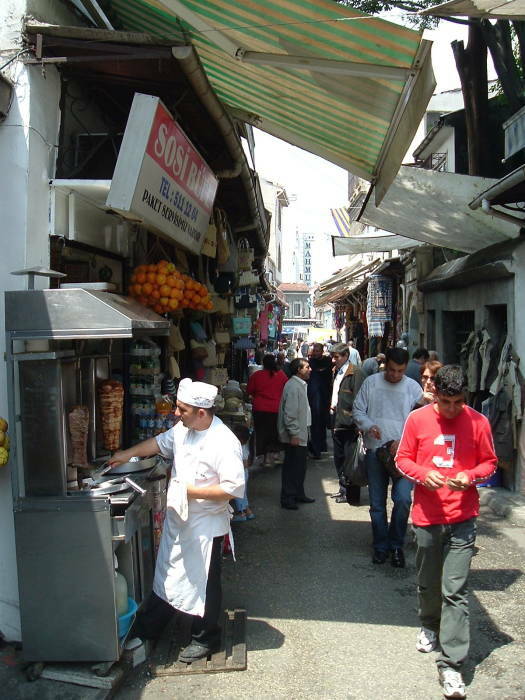 The kebapcı or kebab dealer below can prepare a freshly-squeezed orange juice to accompany your kebab. This is in İstanbul just outside one rear entrance to the Grand Bazaar, heading toward Uzunçarşı Caddesi (Longmarket Street). 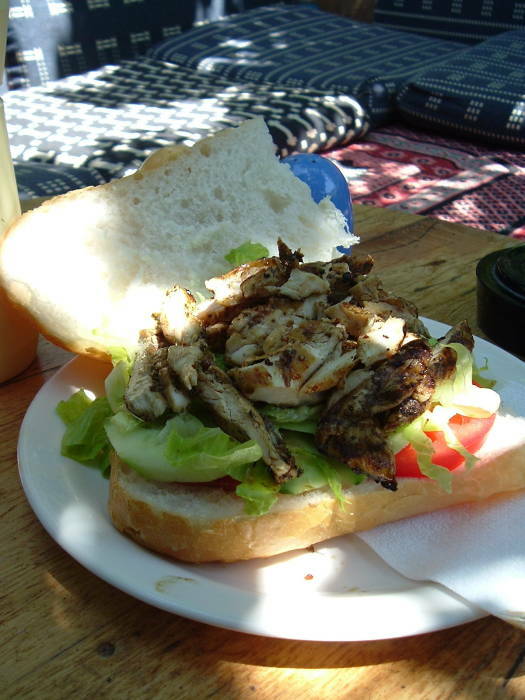 Above is a big sandwich of grilled chicken garnished with lettuce and tomato. It's lunch at one of the treehouse guesthouses in Olimpos. 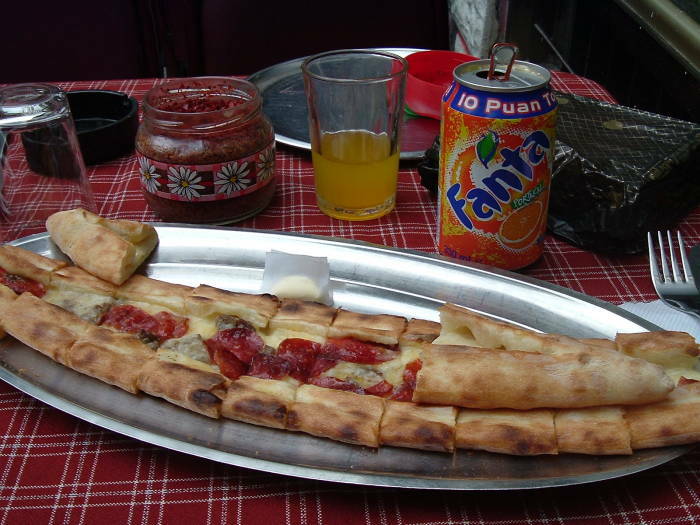 Pide is Turkish-style pizza. Fantastic stuff — cooked when you order it with a wide variety of toppings. You can garnish yours with hot pepper. A jar of crushed hot red pepper is standard on a Turkish table. Lahmacun is made on much thinner crust with finely minced meat and some tomato sauce. It's much more of an Arabic style "pizza". 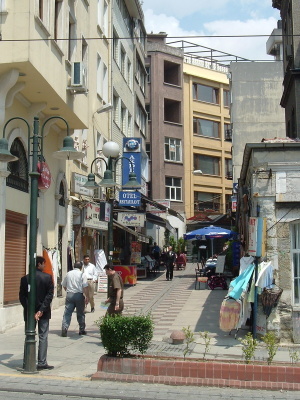 This side street in the Sultanahmet district of İstanbul has a number of pideciler or pide restaurants with sidewalk seating. 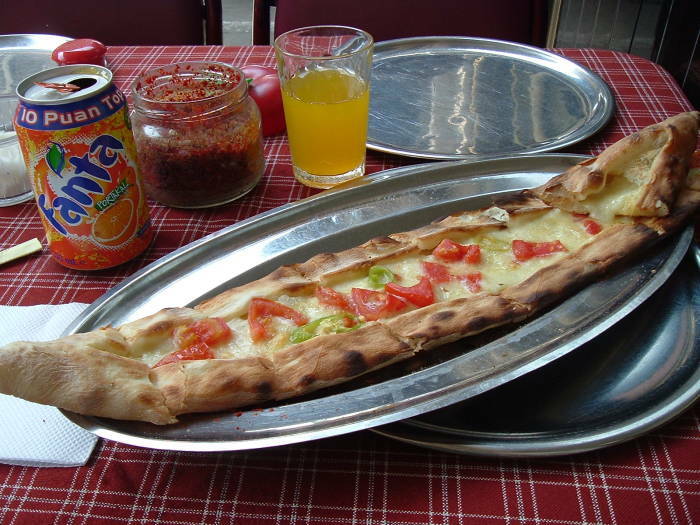 The Kara Deniz Pideci or Black Sea Pizza Shop is one of many with excellent pide. As you might be realizing, -ci indicates a dealer in a given product. You would buy your pide from a pideci, and in the Grand Bazaar you could get a small glass of hot tea or çay from a çaycı. That final vowel varies according to the rules of Turkish vowel harmony. 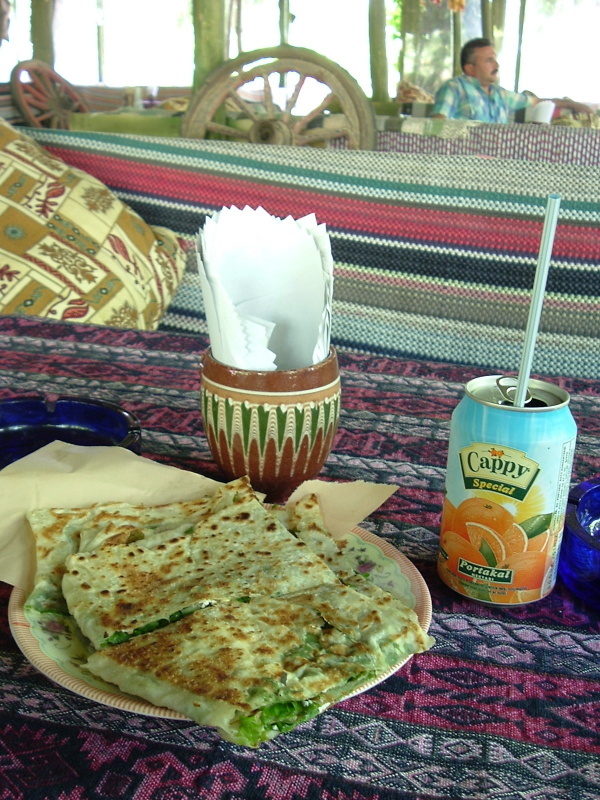 Lahmacun, pronounced as if it were lama-june, is a variation, a little more Arabic in style. 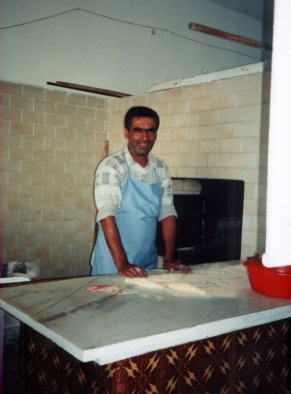 This man is making wonderful lahmacun in Derinkuyu, in Cappadocia. And, of course, great Turkish bread! Garnish of hot peppers, onion and tomato slices. 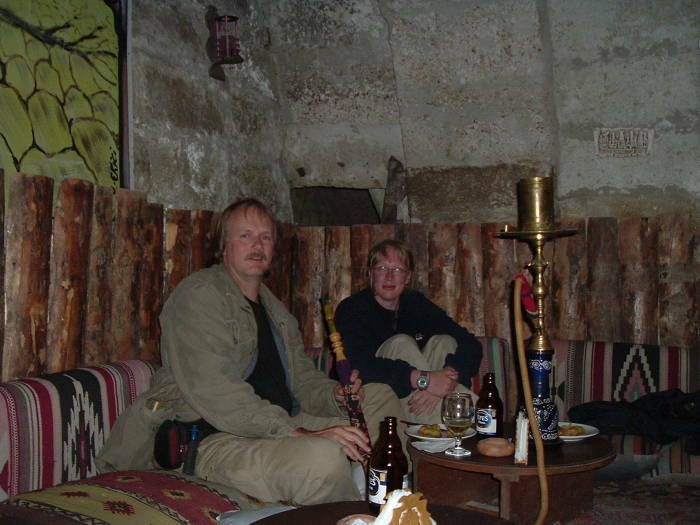 The first picture below shows two large evening meals in Göreme, in Cappadocia. Kebabs and plav, with bread. 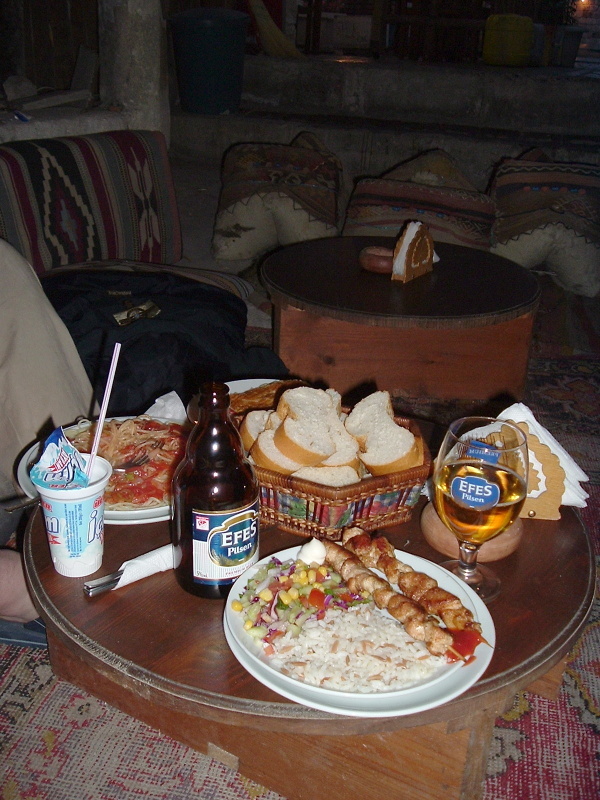 To drink — Turkish Efe Pilsen beer, and ayran (a watery salted yogurt, similar to what is known as kefir in Russia). 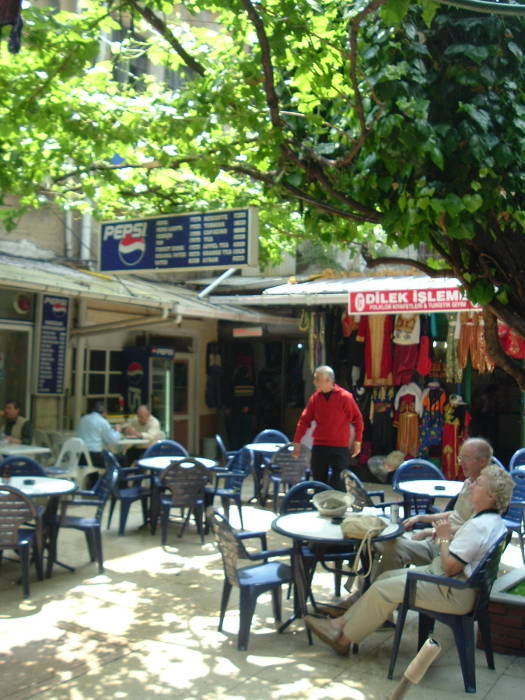 Above we see gözleme for a mid-day snack. Like a crepe, with a wide variety of fillings. And Cappy, a line of drinks made from fruit juice. 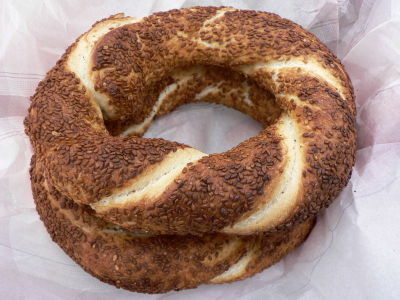 Here are two simit, a toasted bread roll coated with seseme seeds. 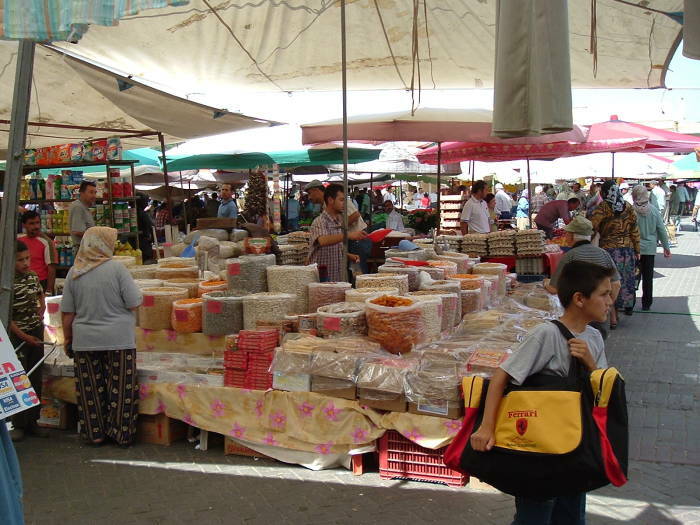 See the simitci, the simit seller, balancing a tray of his goods on his head. 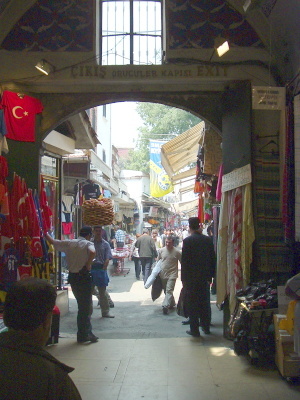 He is standing in an entrance to the Grand Bazaar in İstanbul, in the lane leading to Uzunçarşı Caddesi (Longmarket Street). 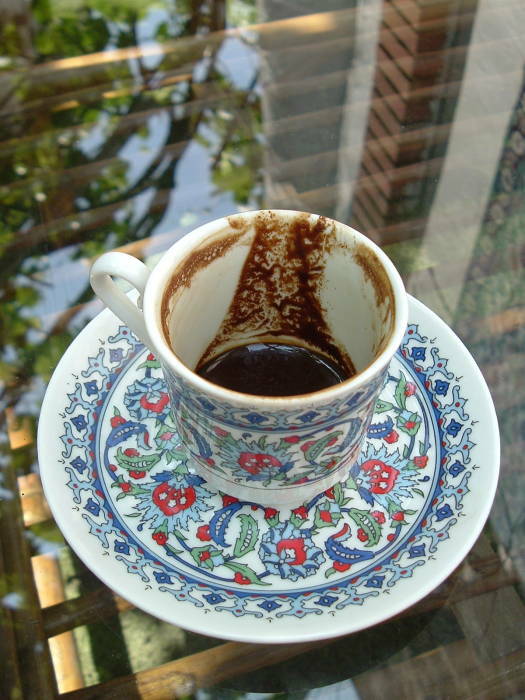 At the end of the meal or for a nice break, have a small cup of Turkish coffee. 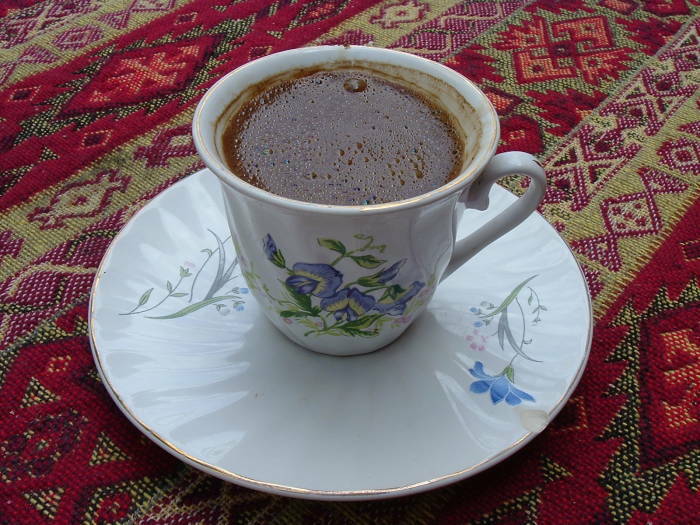 Turkish coffee is prepared by boiling finely powdered roast coffee beans in a pot, possibly with sugar, and serving it in a cup where the dregs settle. If you want it sweet, ask for it to be sweetened as it is prepared. Ask for it sweet — kahve şekerli — or very sweet — kahve çok şekerli. Sip it slowly and let the grounds settle! Coffee originally came from Ethiopia and Yemen. By the late 15th and early 16th centuries AD it had spread into the outlying Ottoman empire in Cairo and Mecca. The Ottoman chronicler İbrahim Peçevi reported the opening of the first coffeehouse in İstanbul: "Until the year 962 (AH, or 1554-55 AD), in the High, God-Guarded city of Constantinople, as well as in Ottoman lands generally, coffee and coffeehouses did not exist. About that year, a fellow called Hakam from Aleppo and a wag called Shams from Damascus, came to the city: they each opened a large shop in the district called Tahtalkala, and began to purvey coffee." And maybe a hookah after your meal? 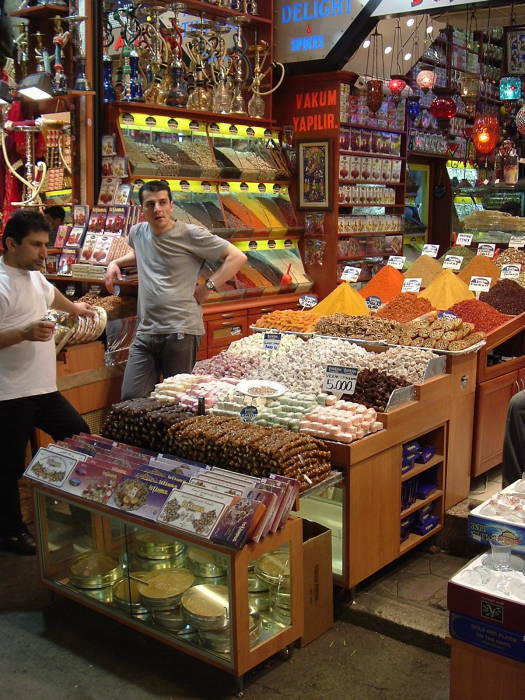 Below are a couple of places in the Grand Bazaar in İstanbul. 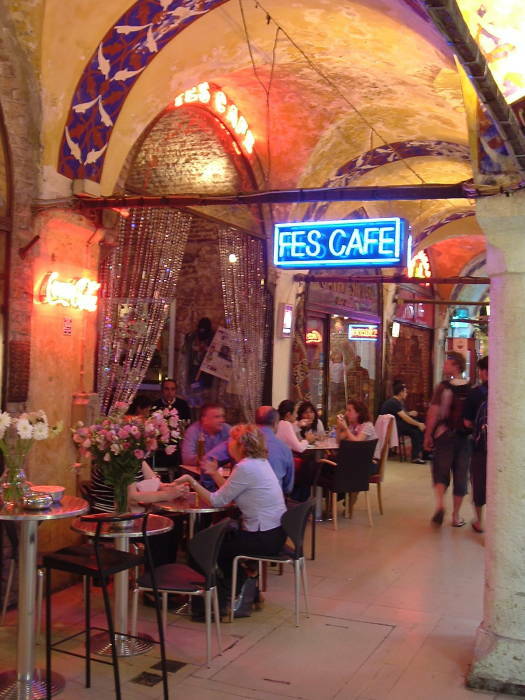 The Fes Cafe, a coffeeshop, and a kebab place with outdoor seating.